Despite some worthy competition from Montevideo rivals Nacional, there’s little doubt that Club Atlético Peñarol is the most successful football club in Uruguay. In fact, their influence reaches even further: in 2009, the IFFHS declared Peñarol the South American Club of the Century. Considering the club’s impressive history -- 50 Primera División titles and 5 Copa Libertadores trophies -- it’s hard to argue with their choice. 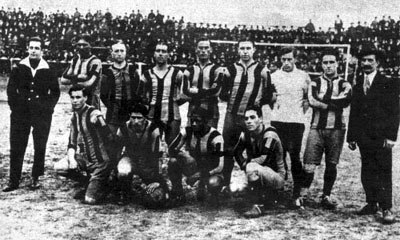 The 1918 Uruguyan champion team. Though Peñarol was officially founded in 1891, its initial main purpose was to increase the popularity of cricket in Montevideo. The official name of the club was Central Uruguay Railway Cricket Club (CURCC). Soon enough, however, their focus shifted to association football. In 1900, they were one of the four teams to take part in the first Uruguayan football league, winning the championship in the process. In 1913, the railroad company that founded the club decided to distance itself from the club’s increasingly volatile local reputation. In December that year, the football section was separated from the club, after which it was immediately renamed Peñarol. In 1914, Peñarol took CURCC’s spot in the league. By the beginning of the professional era in 1932, their trophy room consisted of 9 league titles. Somewhere around the arrival of the Uruguayan professional championship, Peñarol gained an upper hand on their long-time rivals Nacional. From that point onwards, the club saw an immense amount of success on both the domestic and international scene. One early sign of future greatness was the signing of Alberto Spencer, with the nickname Cabeza Mágica, in 1960. Spencer would spend the next 10 seasons at the club, becoming their top goalscorer (326). In Spencer’s debut season with the club, Peñarol won their first Copa Libertadores by defeating Olimpia in the final match. They defended the title the next year with a close-fought victory over Palmeiras, with Spencer scoring the decider in the first leg. In 1966, they went one step further and defeated Nacional, Universidad Católica, and River Plate on their way to the third title in the competition. The club continued to perform well during the ‘70s, but they had to wait until 1982 for their next international trophy. That season, they went all the way in the Copa Libertadores, outlasting Cobreloa on a last-minute goal from Fernando Morena. Despite some financial issues that started plaguing the club during the ‘80s, Peñarol claimed its fifth Copa Libertadores trophy in 1987 with a victory over América de Cali. With these five titles, Peñarol is the third most successful club in the history of the competition. Team players during a Copa Libertadores game in 2011. Despite not winning any major international trophies from that point onwards, the club continued to excel at the domestic level. For example, they won five straight titles from 1993 to 1997, rounding out the millennium with another successful championship run in 1999. This was followed by a testing period in the early ‘00s, but Peñarol eventually bounced back by claiming five more league titles from 2010 to 2018. The crest is based on a flag that resemblance the United States Stars and Stripes flag, but in black and yellow (the colors on the team's uniform since the 19th century) and with fewer stars. On the crest, however, the stripes are ordered vertically and with the stars in the upper part. During the years, the logo has going through minor changes, but the main features have been intact. 1891 The club is established as Central Uruguay Railway Cricket Club. 1900 First domestic top-league victory. 1911 The shirt with yellow and black stripes was adopted. 1913 The club is renamed to Peñarol. 1960 Winning their first Copa Libertadores. 1961 Winning their first Intercontinental Cup. 2016 The club move to the Campeón del Siglo stadium.